COST-EFFECTIVE SCANNER: Consists of the MD802 and MexiCheck Pro, this diagnostic tool provide you with advanced full-systems diagnoses. You are able to test not only 4systems but other systems including Body, Chassis, Powertrain, Communication and more. ADVANCED HARDWARE: Its advanced hardware also facilitates its smooth and fast operation. Android-based tablet with optimized multi-core processor improves the efficiency of repair work and 7-in touchable LCD screen show you an intuitive navigation. Autel, as one of the world's leading manufacturers in the automotive aftermarket, dedicates itself to developing professional diagnostic tools and translating global clients'needs into superior cost-effective and innovative products with strong R&D and production capabilities. 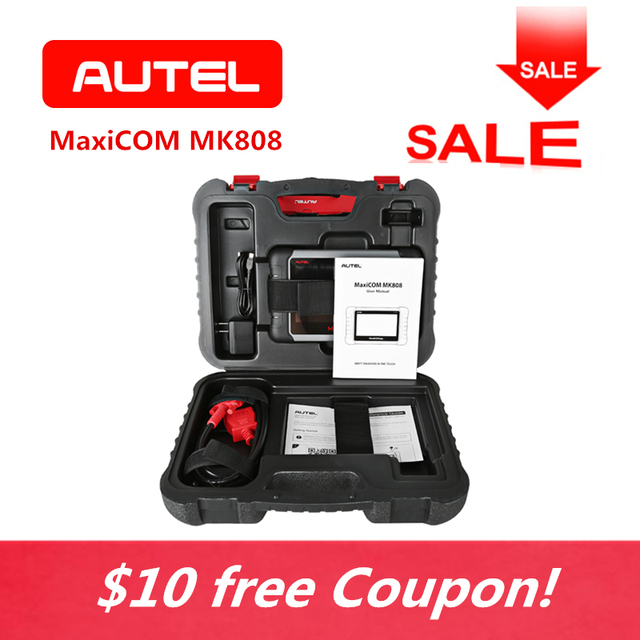 Autel MK808 is an advanced tablet diagnostic tool based on the Android operating system. Consist of MD802 and Mexicheck pro, md802's advantages not only lie in its comprehensive functions including Full systems diagnoses, all obd2 functions, various reset features (Oil reset, EPB/SAS/BMS/TPMS/DPF reset), but it its excellent performance in advanced hardware, faster and more accurate diagnosis. EPB Reset: Maintains the electronic braking system safely and effectively through deactivating and activating the brake control system, assisting with brake fluid control, opening and closing brake pads, and setting brakes after disc or pad replacement, etc. SAS Reset: Performs calibration for the Steering Angle Sensor (SAS), which permanently stores the current steering wheel position as the straight-ahead position in the steering angle sensor EEPROM. On successful completion of the calibration, the steering angle sensor fault memory is automatically cleared. TPMS Reset: Quickly looks up the tire sensor IDs from the vehicle's ECU, as well as to perform TPMS programming and reset procedures after tire sensors are replaced. DPF Regeneration: Performs the regeneration procedure which is the DPF cleaning operation to clear the blockage through continuous burning of the particulate matter captured in the DPF filter. BMS Reset: Re-match the control module and motoring sensor for battery detecting more accurately, clear original low battery information and prevent the related control module from detecting false information. Anti-theft matching: By disabling the lost car key, this diagnostic tool can effectively protect your car from being stolen. Erasing Codes & Reset: Turns off Check Engine Light (MIL), clears codes and resets monitors. Data Stream: Reads and displays live ECU/PCM data stream, plotting functions graphically and stores freeze frame data. I/M Readiness Status: Shows whether the various emissions-related systems on the vehicle are operating properly and are ready for inspection and maintenance testing. View Freeze Frame Data: Check the certain vehicle conditions which are recorded by the on-board computer at the time the emission-related fault occurs. O2 Sensor Test: Allows retrieval and viewing of O2 sensor monitor test results for the most recently performed tests from the vehicle's on-board computer. On-Board Monitor Test: Retrieves and displays test results for emission-related power train components and systems. Component Test: Allows initiating a leak test for the vehicle's EVAP system. Except its widely-used software, the advanced hardware also brings glory to its smooth and fast operation. 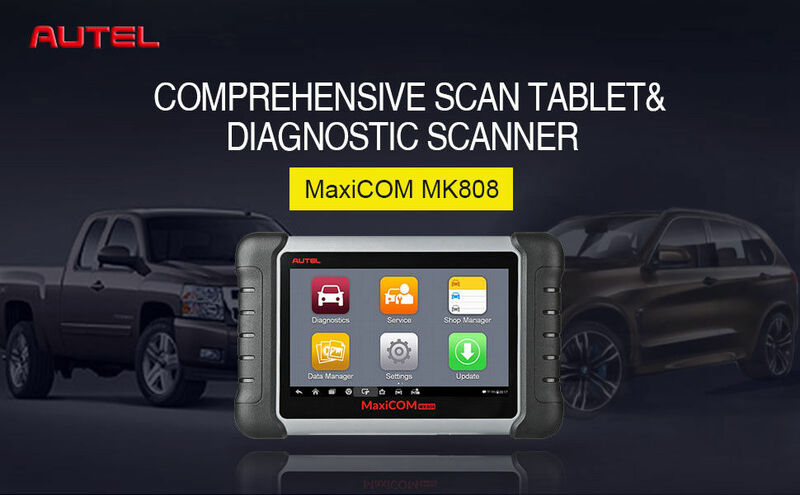 Android-based tablet diagnostic tool greatly improves the working efficiency with performance and power optimized multi-core processor. 7 inch touchable LCD screen does a great job in the better using experience; you can directly get what you need with intuitive navigation. 32 GB memory is not only an extended storage space but a way to reduce the possible condition of slow response. Built-in battery has up to 4.5 hours battery life giving you a worry free operation experience. SHOP MANAGER: You can well manage the workshop information with 3 available functions within this application: Vehicle History, Workshop Information, and Customer Manager. Intuitively look up the summarized details. DATA MANAGER: The best solution for the data related operations, you can store, print, and review the saved files in Image, PDF,Review Data, Apps Uninstall or Data Logging. REMOTE DESK: you can directly get ad-hoc remote support from Autel via Team Viewer software. ACURA, AUDI, BENTLEY, BENZ, BMW, BUGATTI, CHRYSLER, CITROEN, DODGE, DAEWOO, FORD, FIAT, GM, GMC, HOLDEN, HONDA, HYUNDAI, INFINITI, ISUZU, JAGUAR, JEEP, KIA, LAND ROVER, LEXUS, MAYBACH, MAZDA, MINI, MITSUBISHI, NISSAN, OPEL, PORSCHE, PEUGEOT, RENAULT, SAAB, SCION, SEAT, SKODA, SMART, SPRINTER, SUBARU, SUZUKI, TOYOTA, VAUXHALL, VOLVO, VOLKSWAGEN, VW.